With the founding of SBEP in 1989, a partnership among local governments and other agencies was formed to reverse a decades-long decline in the health of Sarasota Bay and its watershed. The initial partners agreed that the SBEP would begin by producing three major documents to characterize the contemporary conditions of Sarasota Bay and to prepare a way forward for management: a State of the Bay Report, a Framework for Action, and finally a Comprehensive Conservation and Management Plan. Since then, the SBEP has produced a State of the Bay Report every five years that characterizes the progress made toward its management goals. After the SBEP’s interlocal agreement was signed in 2004, SBEP has revisited its management goals every five years through updates to its Comprehensive Conservation and Management Plan (CCMP). The SBEP most recently updated its CCMP in 2014. Each of the 28 National Estuary Programs is charged with developing and implementing a CCMP, which establishes priorities for activities, research, and management of the estuary. The CCMP serves as a blueprint to guide future decisions and actions and addresses a wide range of environmental protection issues and opportunities including water quality, habitat, wildlife, and public access to Bay resources. The CCMP is based on a scientific characterization of the estuary and is developed and approved by a diverse coalition of community stakeholders. In support of the CCMP, SBEP works with partners within the scientific community to conduct research to help fill gaps in our knowledge and to answer questions regarding the health and vitality of Sarasota Bay. The SBEP’s CCMP was last updated in 2014 to include a State of the Bay Report on the current quality of Bay resources and a revised list of action plans with accompanying goals, policies, objectives, and actions to guide management decisions within the Bay and its watersheds. 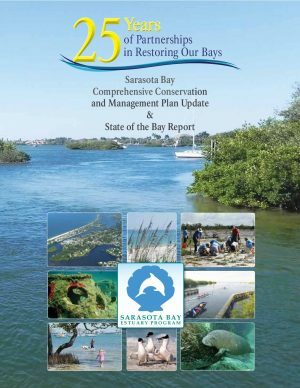 The Comprehensive Conservation and Management Plan for Sarasota Bay contains seven action plans, each addressing a different focus area in Bay restoration.